OK, blog friends, are you ready for this? I’m participating in NaNoWriMo this year. 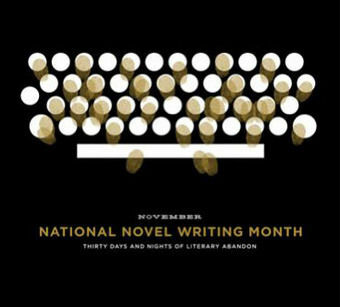 That’s National Novel Writing Month. That means writing 50,000 words in 30 days, or 1667 words a day. Yikes! I already write for a living, so I’m crossing my fingers that I can pack another 1667 into each 24 hours. So why am I telling you this? 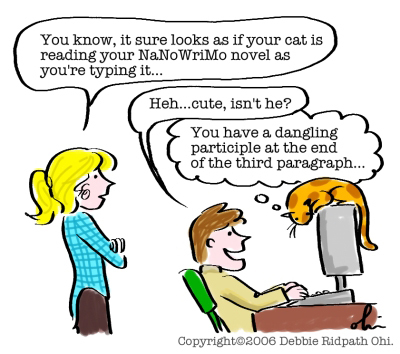 Well, the folks at NaNo recommend that writers tell everyone they know that they’re participating in the novel writing so we’ll be shamed into finishing our novels. Can’t tell everybody we’re writing a novel and then not live up to that standard, you know! There’s a lot of criticism of NaNoWriMo, and rightly so. Not everybody is a good writer. Some people are just really good at churning out a whole lot of garbage (well, OK, I was an English major). What I hope to gain from NaNoWriMo is a serious kick in the pants. I have an idea for a novel that I think is pretty good, yet I keep backing away from it. “Oh, I don’t have enough time,” and “I’m a journalist. Anything longer than 30 inches is asking quite a lot,” and “It’s just going to be drivel anyway, so why try?” have been holding me back long enough. Here’s what my novel is going to be about: A young journalist returns to his hometown of Two Ocean in northwestern Montana for a job at the local newspaper, the Two Ocean Times. He discovers a new side of his town, and learns that while a place like Two Ocean is hard to leave, it’s even harder to stay. So, I expect that the vast majority of what I write will indeed be drivel, but I’ll have a solid start and clean up and edit from there. OK, here’s the part where you all promise not to laugh at me in the middle of November when I’m insufferably whiny. As of right now, though, I’m insanely excited!